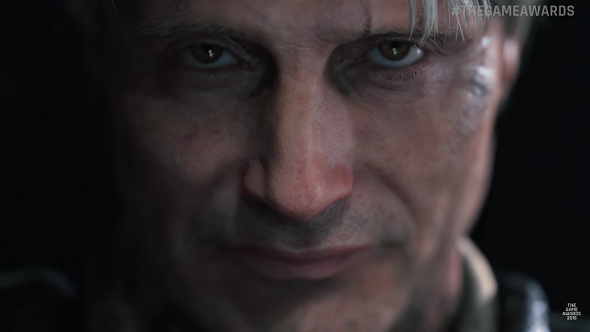 We reported on rumours of Hannibal actor Mads Mikkelsen possibly showing up in Death Stranding back in August, and it looks like that speculation was right on the nose. The Danish actor showed up in a new Death Stranding trailer during tonight’s Game Awards. For more from The Game Awards 2016, hit up the PCGN homepage. The new trailer shows Pan’s Labyrinth director Guillermo Del Toro creeping through a WW2-looking warzone with a baby in a jar. To say it’s bizarre would be an understatement. War planes trail the sky, with inky umbilical cords following behind them. Tanks roll by at street level, with sea creature-style appendages poking through from inside. At the end of the trailer Mikkelsen turns up leading a team of soldiers, some with the skin removed from their faces. Baby dolls float through the oil that’s almost at knee level, and Mikkelsen orders the soldiers – also tied to him by cords – to attack. I told you it’s weird. Check out the trailer above and see for yourself.